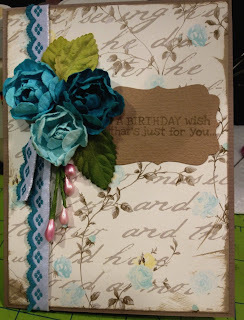 on Catherine and Cathy Create- it's the August Cool Card Challenge "In the Garden". There are some really purdy cards on there!! Such talented ladies. 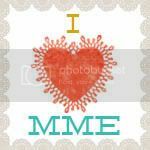 The design team uses all products from Stampin'Up, and I have Stampin'Up envy but have only just begun my Stampin'Up hoarding, so I only have a few things. Soooo, on my card (submissions don't require Stampin'Up supplies), the patterned paper, label punch, and ink are from, you guessed it, Stampin'Up!! I just so happened to have these lovely flowers and leaves by Prima, scalloped ribbon by Websters Pages, the cardstock is unknown! and the little pink things came from dollar store flowers that I picked apart. You never know what you can find to scrap with at the dollar stores! I seem to do most of my work after midnight. I always was a night owl. And, well, working permanent night shifts doesn't help!! Darlene, beautiful card. Those flowers are just perfect! Well you work quite "Awesome-ly" past midnight!! FABULOUS. FABULOUS! Maya Road Blog Hop and Giveaway!